If you'd like to donate to TheRoad2WD for event registration fees and fitness equipment, please click the button below. I had a feeling I’d be out of the 280s this week!!! So happy to be down below goal #2 today. I got this low during a fast for about a day but went right back to the 280s. I’ve really worked hard these last few weeks and I’ve got no intention of letting up. I’ve got 10 miles to run in September and a lot of training to do to get there. 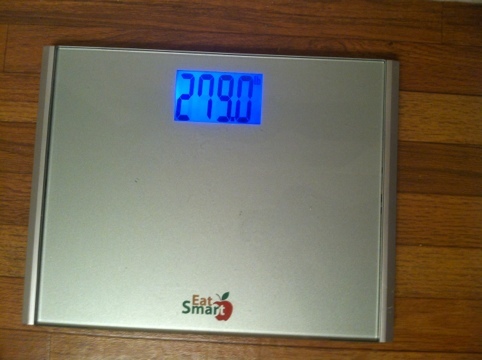 My next goal is to get under 250. The routine I’m doing every day is going to see me get there before the big run! I may not be ready for the beach this summer but in 2013…look out! That’s awesome! You’re like 100 pounds lighter than when we used to work together. Keep doing what you’re doing! You’re much more motivated than me, LOL. I need to start working out again.